Just a few hours drive from Little Traverse Bay in Northern Michigan is the recently named Most Beautiful Place in the America: Sleeping Bear Dunes National Lakeshore. Located near Empire just outside Traverse City, this pristine spot has 64 miles of Lake Michigan beaches, two islands, and 26 inland lakes in addition to the famed dunes. Fall is a spectacular time to visit the Sleeping Bear Dunes. The gorgeous fall colors along Lake Michigan combined with the brilliant blues of the inland lakes and Lake Michigan make this is perfect destination for hiking, beach climbs, a fall drive, and more. The massive and impressive sand dunes in the park begin 450' above Lake Michigan on a glacial ridge formed long ago. The famous Dune Climb is a test for the most aerobically fit--it is a wonderful adventure to run down the steep dunes and climb back up again. The Philip Hart Visitors Center in Empire offers an introduction to the park. 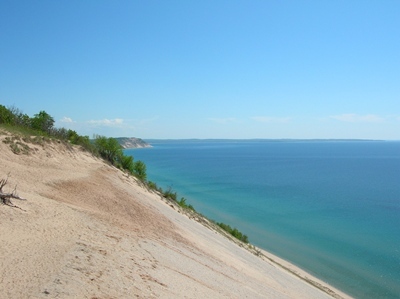 The seven-mile long Pierce Stocking Drive explores the geology, plant life, and history along with beautiful views of the dunes and Lake Michigan, Glen Lake, and the Manitou Islands. Observation points and picnic areas are located along the drive. The restored logging community of Glen Haven highlights the history of the area. Tour the Sleeping Bear Point Life-Saving Museum to learn about the men who lived and worked in the area. Visit the General Store and the Glen Haven Blacksmith Shop to watch a blacksmith mold iron bars into household articles, or walk through the Cannery Boat Museum to see a collection of wooden boats used on the Great Lakes. Northern Michigan residents and visitors are not surprised that the spot received national accolades: this place is special!